We’ve been making some PC changes around the house lately. This weekend, I moved my former test desktop upstairs to my son’s bedroom, having swapped it for an increasingly unreliable Dell XPS 2720 All-in-One. While the Dell had a built-in WiFi adapter, I had to switch the test machine over from its built-in Killer E2200 GbE wired interface to an Asus USB 3.0 AC56 802.11ac WiFi adapter instead. As soon as I installed this device and turned the PC over to its proud new user for homework, it started failing repeatedly. Sigh. Time to start troubleshooting … which ultimately led me to failing WiFi gets driver fix. When Failing WiFi Gets Driver Fix, Why Does This Fix Work? There were two drivers available for the device, one labeled Microsoft, the other RealTek. The Microsoft driver was currently selected and running … sort of. Then I remembered that we’d just updated this machine to the Fall Creators Update (Version 1709) a few weeks earlier. And though I’d run and used the Asus adapter prior to the upgrade with no problems, the same was no longer true now. 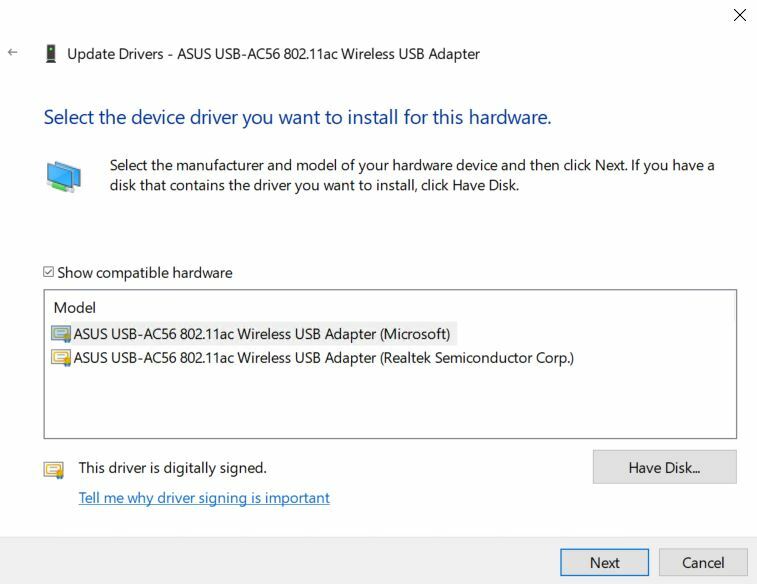 Because the Windows Installer uses its own judgment to select and run device drivers when a major upgrade occurs, I immediately surmised that the Microsoft entry had been supplied by MS when I plugged the device in for the first time after the upgrade. I was convinced that the other driver, however, was the one I really wanted to use instead. When one driver comes from MS and the other from the WiFi chip’s maker, common sense dictates that trying the chipmaker’s version might be a good idea. The Fix Is In … and It Works! And indeed my guess turned out to be correct. No sooner did I switch to the other driver than the problems abated completely. Just for grins, I visited the Support page for this device, selected Windows 10 64-bit as my OS, and downloaded the driver and utility file. Guess what? The driver file sizes in that ZIP archive matched the installed file sizes (.cat and .inf) exactly, while the MS versions did not. Apparently, I’d already installed the right drivers once before and had things working properly. But because I’d upgraded Win10 and the installer had chosen a different driver instead, I ran into the “dropped wifi connection” problem I’ve read about from others who’ve experienced similar travails. At least the fix was easy to figure out, and easy to apply. And so it goes, here in Windows-world!